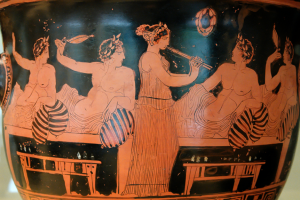 I have spent a lot of my time in the last 20 years or so working on the ancient Greek symposium (drinking party: the word literally means ‘drinking together’), especially its afterlife in the Roman Empire and in late antique/early Christian culture. If I had to choose just one text that illustrates the special fascination of that topic it would be Plutarch’s Sympotic Questions(sometimes referred to by its Latin name Quaestiones Convivales), which claims to record a series of symposium conversations (nearly 100 in total) from across Plutarch’s life, from the late first and early second centuries CE. Clearly Plutarch’s descriptions are heavily idealised, but they nevertheless give us a remarkable glimpse of how one Greek intellectual envisaged utopian feasting as something that could be achieved in his own lifetime within the philosophically informed communities he was a part of. There are lots of things I wouldn’t want to imitate. Ancient feasting was hierarchical and elitist. 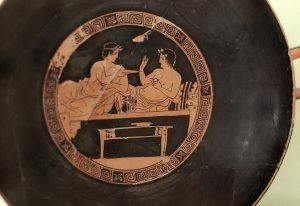 The Greek symposium was traditionally a men-only occasion, unless there were women present as entertainers or courtesans—certainly there are no women joining in with the philosophical conversations of Plutarch and his friends. Slave-owning was standard practice among the Greco-Roman elite, and Plutarch would have been served by slaves in his symposia: it is astonishingly hard to find anything in ancient literature that challenges or even questions the rightness of that (I sometimes wonder whether later generations will look back on our own collective insouciance about meat-eating with similar bewilderment). Ancient Greek and Latin literature also gives us some of our most horrifying descriptions of social humiliation in feasting contexts: we have lots of examples from Latin literature which describe different guests being treated differently, although that is often contrasted with an idealised image of the more equal symposium culture of the Greek-speaking east. What about the food? Ancient Greeks and Romans clearly ate a more sugar-free, free-range diet, and in most cases presumably with a much greater reliance on local production. But actually elite diets in the big cities of the Roman empire in many ways anticipate our own cosmopolitan eating habits. 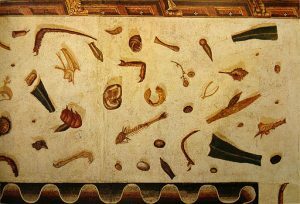 The ability to offer an array of foodstuffs from across the Mediterranean, side by side with a wide knowledge of different local customs and delicacies, was a symbol of imperial control and individual wealth. Ancient elite dining always involved reclining, picnic-style—but on couches: not good for the digestion, perhaps, although if we tried it, it might remind us that the meal is a special place, a time set apart from the day-to-day business that we associate with sitting and standing. There was also a larger-scale tradition of communal eating and drinking, often in the open air, where the whole city would participate in feasting following the sacrifice of animals to the gods: are there things we could learn for our own atomised communities from those very public celebrations of communal identity? But above all I am interested in what we might learn from ancient ways of talking in the symposium. The food came first; drinking and talking followed afterwards—so there was a formal space for conversation as the climax of the shared meal. Sympotic talk was equal and non-hierarchical, at least in principle: each guest should have the chance to speak in turn (most famously in Plato’s Symposium, where different speakers take it in turn to give a speech in praise of love). Plutarch talks repeatedly about the ‘friend-making’ character of the symposium. The conversations he records cover a huge range of topics, mixing scientific and literary or philosophical discussion. They also mix different age ranges, with respect for both old and young: Plutarch is fascinated by the way young men learn the techniques of sympotic conversation through participation; he also gives the starring role in several conversations to his grandfather. Two things above all jump out at me from those traditions of sympotic talk as having a particularly powerful potential for our own futures. The first is its speculative quality. Over and over again Plutarch makes it clear that he values talk that is open-minded and ingenious. Over and over again we see guests addressing a particular problem or question (sometimes formally proposed by one of the diners) and taking it in turn to try out an answer. That doesn’t mean that they speak at random, or with no conviction, and no concern for the truth. But it does mean that the symposium is a special space set apart from the usual day-to-day stakes of argument: it is a testing-ground, a place to learn the techniques of discussion and deliberation and to take pleasure from them, a place to stimulate new kinds of curiosity and new desires for understanding of the world around us—not agonistically or forcefully, like some kind of competitive debating society, but as a place to test out ideas freely and playfully. The other is a tradition of talking about food and drink, and about the symposium and its associated manners and traditions, at the symposium itself. Here too we might not want to imitate word for word what we find in those ancient texts (topics from Plutarch’s work include ‘Why people become hungrier in the autumn’, ‘Why sheep bitten by wolves have a sweeter flesh, but a wool that breeds lice’ and ‘Why women are most liable to intoxication and old men most quickly liable’), but there are many other much less frivolous examples (the very first conversation in the work, about ‘Whether philosophy is a fitting topic for conversation at a drinking-party’, goes right to the heart of the principles on which the work is based). And the idea that we should interrogate our own habits precisely in the place where they are on display seems potentially like a very empowering one. When I eat with friends and family I think that often does involve some discussion of the food we are eating and the practices we are engaged in, but my impression is that that can often be cursory and even a bit apologetic—polite, parenthetical enquiries meant to compliment the cook, or prefatory chat before we get to the business of proper conversation: talking about friends, experiences, politics, children, sport, plans, holidays, work, cultural change, music. But surely we should be talking seriously and at length—and also with pleasure—about what we eat, about where our food comes from, about the social and political implications of our habits and traditions of eating and drinking?—all things that tend to go uninterrogated precisely because they are associated with everyday routine. The ancient Greek symposium gives us a set of models for conversation that might help with that. Jason König is Professor of Greek at the University of St Andrews. His work is focused broadly on the Greek literature of the Roman Empire. His 2012 book Saints and Symposiasts: The Literature of Food and the Symposium in Greco-Roman and Early Christian Culture, brings Greco-Roman and early Christian literature of the Roman Empire into dialogue. A related series of publications aims to take a fresh look at ancient scientific, encyclopaedic and miscellanistic writing. He has recently finished directing a Leverhulme-funded project in St Andrews (together with Greg Woolf) on ‘Science and Empire in the Roman World‘. The last of the three edited volumes from that project, entitled Authority and Expertise in Ancient Scientific Culture, was published in early 2017 by CUP. His main current project is a book on mountains in ancient literature and culture, aiming to shed new light on the sophistication of ancient engagement with mountains in both literature and lived experience, and to bring the ancient evidence more into dialogue with scholarship on postclassical representations of mountain landscape. The project is supported by a three-year Leverhulme Trust Research Project Grant, from July 2017, entitled ‘Mountains in ancient literature and culture and their postclassical reception’ (the project website includes regular blog posts).